Let me just give a little disclaimer at the beginning of this: I know I don't look really out of shape; I'm a pretty healthy weight. But that doesn't mean I'm in good shape, it just means that I was blessed with a good metabolism. Also, I'm clearly not a medical professional, and this is not medical advice. My husband decided to start running, and went out and ran a mile non-stop on the first day. One of my best friends runs marathons. If you're like either of them, you can just click on to something else. This is for those of us who struggle. When I first decided I wanted to start running, I thought a couch to 5k program sounded perfect. I downloaded the free Runkeeper app and took off. But this is how out of shape I was: even it was way too hard for me. Talk about discouraging! I got the Runkeeper app and just started doing what they call free runs. It shows you your time and distance and a few other fun things as you run. I started out doing a mile, running for 30 seconds and then walking for 1.5 minutes. And that was really hard for me! I'm serious! Do whatever interval pushes you just enough that you feel challenged, but not so much that you can't sustain it. Once I was doing that okay, I kept at the same interval, but increased to 2 miles. Once I was doing that okay, I have kept at 2 miles and worked on my speed. I upped to running 1 minute and walking 1.5 minutes, then running 1 minute and walking 1 minute, then running 1.5 minutes and walking 1 minute, and so on. As of this writing, I've recently started running 2 minutes and walking 30 seconds, and it feels so great! It's been fun to stay at the same distance and work on speed, because Runkeeper tells you when you set a new personal record. Boy is that satisfying. At some point, I will increase my distance, too. I haven't decided when I want to do that. A comparison of my first ever run that I tracked with Runkeeper (top) vs this morning's run (bottom, the grey markers are where I had to pause several times to stop for traffic because it's just a little backroad). It's so fun to see my min/mi go down, down, down, and it motivates me to push myself! I have a great running partner. Running with my dog, Molly Brown, not only motivates me to get out of the house for her sake, but she is so excited when we go running that she keeps my pace significantly faster than I would run and walk on my own. She is fantastic on a leash and literally drags me along when I am struggling (in a good way). Something about running with her just makes me happy. Running (actually I was on a walking interval when I snapped this) with Molly Brown. I run on a scenic road. I think running anywhere that isn't a track or treadmill is much easier and more interesting, even with all the hills on my road. We got a treadmill last winter and use it when the weather is inclement, but it is SO much harder to go the same distance and pace on it than it is on the road where I have things to look at and distract me from what I'm doing. There was a time in my life when my knees hurt so bad from arthritis that I couldn't have dreamed of running. I could hardly walk up stairs when the weather was just right. But I went gluten-free several years ago for other reasons, and one happy side effect of that is that I do not have ANY arthritis anymore. Seriously. None. If arthritis is an issue for you, please consider a gluten-free diet. Even if you aren't medically allergic or sensitive to gluten, it has been proven to cause inflammation in your body. It has been honest-to-goodness life-changing for me. 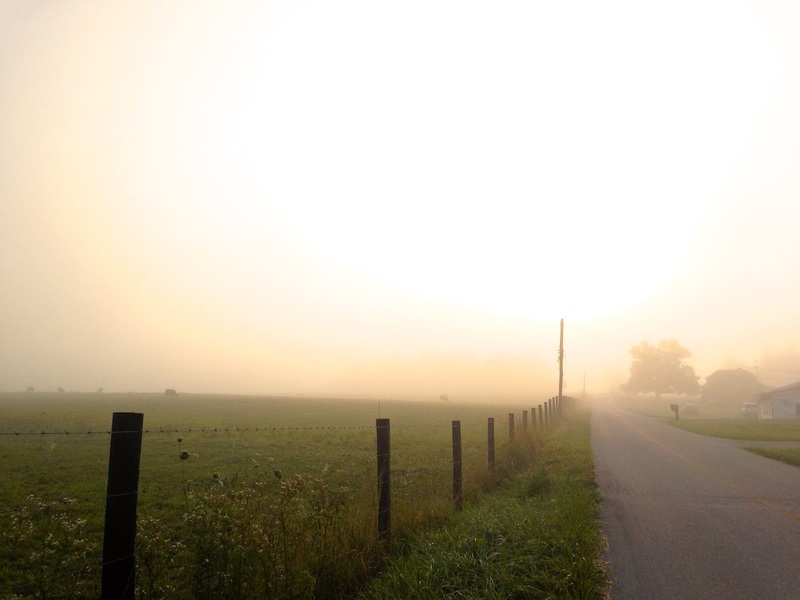 A beautiful foggy morning on the road where Molly Brown and I run. So those are my tips from a reformed not-runner! 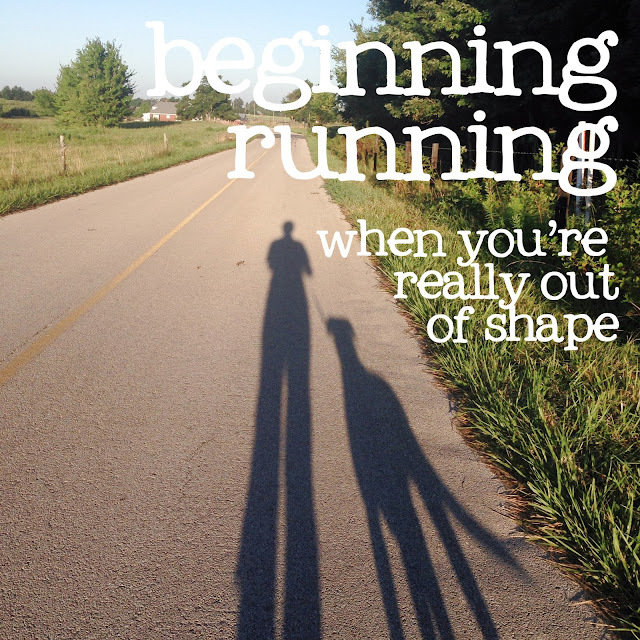 If you are a seasoned runner and actually read this, then after you pick yourself up off the floor from laughing at how out of shape I am, please share any tips you may have for newbies, too!